In addition to forming the placenta and enabling your baby to receive nutrients during pregnancy, water is also used to form the amniotic sac during pregnancy. There’s no denying the fact that hydration during pregnancy plays a very important role in the healthy development of your baby. Water transports nutrients to you & your baby. Water aids in waste removal. As gross as it sounds, when we’re pregnant, we’re excreting for two . . . Water dissolves the waste products and helps flush them from the kidneys. Adequate hydration during pregnancy also helps to move solid wastes more speedily down the digestive path, which is great to help with that usual pregnancy constipation. We’ve already talked about poop, so hey — why not throw in some urine talk as well. Drinking enough water also keeps your urine nice and diluted. Which not only keeps things flowing, but keeps UTI’s at bay (urine that hangs out too long in your bladder can become a breeding ground for infection-triggering bacteria). All pregnant mamas will experience bloating in some form or another due to a normal and necessary increase in body fluids . . . but the more water you drink the better if you want to ward off that puffy look. Lots of women thinking drinking lots of water = lots of water with water weight, when in fact the opposite is actually true. Drinking plenty of liquids can keep excessive water retention under control (source)! (Another collective pregnant moms cheer). 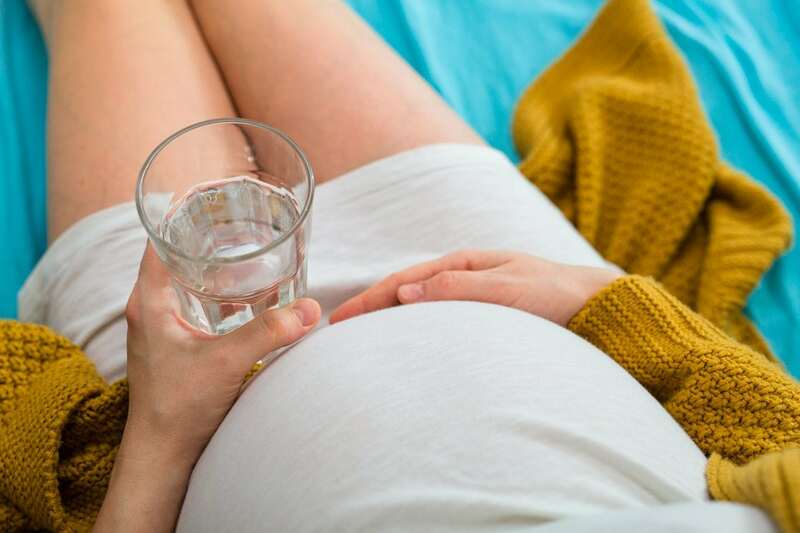 Dehydration during pregnancy can lead to serious complications including neural tube defects, low amniotic fluid, inadequate breast milk production, and even premature labor. These risks, in turn, can lead to birth defects due to lack of water and nutritional support for your baby. The American Pregnancy Association recommends that pregnant women drink a minimum of 8-12 glasses of water per day in order to prevent dehydration. 1. Make it fun! Water’s the best drink, by far, but if you’re struggling to stay hydrated, consider making water fun finding sparkling or flavored waters, adding lemon or other fruit, or drinking decaffeinated teas, or even clear soups. 2. Limit your intake of soda, as well as of beverages containing caffeine, since they have a diuretic effect.